A477 New-build highway UK. Ramboll. Photo:Aled Llywelyn. 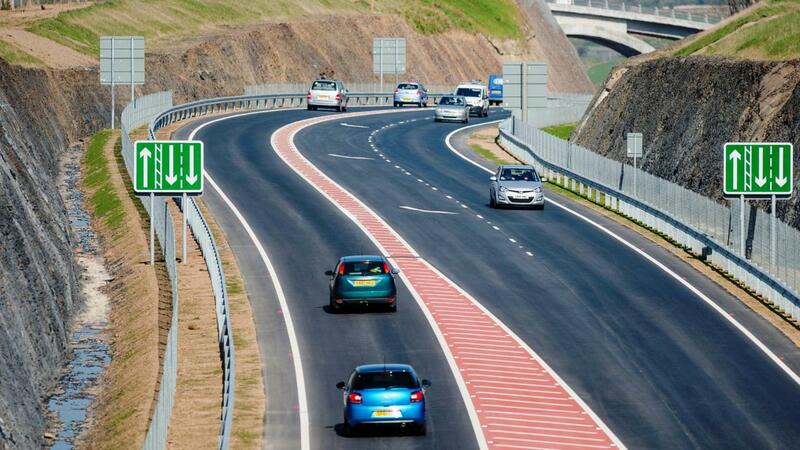 The improved section of the A477 road forms part of the Trans European Road Network (TERN), a strategic route linking mainland Europe with West Wales and Ireland. The original road was considered sub-standard in a number of aspects and the Welsh government appointed SRB Civil Engineering and Ramboll’s transport and environmental consultants in an Early Contractor Involvement (ECI) form of contract to design and deliver a £47m improvement scheme. The 9.3km stretch of trunk road between St. Clears and Red Roses in Carmarthenshire in Wales is a main route linking Pembrokeshire to the M4 motorway. The section consists of 8.4km of off-line new build and 0.9km of on-line improvement. Construction features included 15 new structures and improvements, alterations to two existing structures, including the Grade 2 listed Pont Newydd (bridge) and three sections of wide single 2+1 carriageway (forming more than half the length of the route), plus two significant rock cuttings. A further 2km takes a new route, which passes through an environmentally sensitive area having direct and indirect impacts on the Carmarthen Bay Special Area of Conservation. The visual impact was mitigated by the use of deep rock cuttings and high earthwork embankments with environmental management of the area continuing for up to 5 years following the completion of the scheme in 2014. Our involvement included the development of the design, including value management and scheme engineering, and a proposal for the project's target costs. We also prepared an environmental impact statement as well as draft Orders and publicity material for use in the local public inquiry. Design modifications were made following the inquiry and the whole scheme was approved to proceed. Ground engineering was at the forefront of the design and Ramboll’s site-based geotechnical staff adopted a proactive observational approach which promoted value engineering for 1.5km of rock cutting up to 25m deep. Maximising the reuse of site won materials was key to mitigating environmental impact during construction, while detailed assessment, analysis and the practical application of rock mechanics was critical to the success of the iconic Tavernspite Road high skew arch bridge. Throughout our involvement, we worked closely with the main contractor, SRB Civil Engineering UK Ltd, the client Welsh Government and key stakeholders, developing the scheme sufficiently to bring it to Public Inquiry and gain approval for construction. We also ensured that environmental commitments were met and enabled constructability of the detailed design, providing highways, structures and geotechnical design together with environmental design and management. The project won the prestigious George Gibby Award in the ICE Wales Cymru Awards 2015 for projects over £3m. The judges felt that the scheme provided 'significant improvement to wildlife habitat and community space while resolving a potentially serious flood risk.' They also noted that it was good to see value being added whilst the risks are reduced and opportunities were seized. The award was made to the whole project team. In 2014, the project won the CEEQUAL (Civil Engineering Environmental Quality Assessment) Excellent Whole Project Award with a score of 90.4%. (It is not possible to achieve a 100% score due to conflicting environmental or social issues in the assessment.) CEEQUAL Awards are gained by projects and contracts that have been assessed against detailed and specific environmental and social criteria (CEEQUAL Methodology) by a CEEQUAL-trained Assessor and then verified by a CEEQUAL-appointed Verifier. The scheme also triumphed in the Integration and Collaborative Working category at the Constructing Excellence in Wales (CEW) Awards 2014. One of the biggest events in the Welsh construction calendar, the awards showcase projects that have taken Wales forward and demonstrate that collaborative working is the best way of meeting Government targets and delivering a first class infrastructure for Wales. Describing the A477 improvements as “an exemplar project for the whole industry on how to deliver a landmark scheme collaboratively” the CEW judges were also particularly impressed by its partnership charter. This not only enshrined “a non-confrontational approach and open door policy that allowed the client to work as closely as possible with its supply chain partners” but also “embedded a culture that supported integration and collaboration. The new road section was officially opened on 16 April 2014 by Edwina Hart MBE. The project triumphed at the Constructing Excellence in Wales (CEW) Awards 2014. Recognition of the road scheme's environmental sensitivity and integrity.